General Description: The Hopewell-Snyders type is a medium to large sized, broad and thick point with corner notches and excurvate blade. The excurvate blade terminates in prominent barbs in many specimens. The stem is short in relation to the overall length of the point and is expanding. The base expands and is almost always convex or excurvate in outline. The corner notches are wide to the point of almost being considered side notches and the notches are well rounded. Grinding of the stem is not present. Most specimens from western Indiana and Illinois are made of Burlington flint which was heavily utilized by the Woodland peoples of the region. 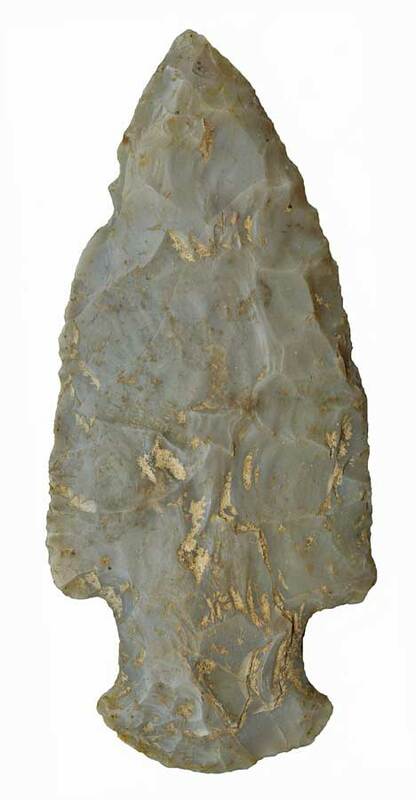 Many of the points found in southern Indiana to western Ohio are made from Harrison County, Indiana, gray flint. Upper Mercer and Flint Ridge flints were occasionally used in Ohio. Additionally, other locally available white and tan cherts were also used. This is a confused projectile point type in so far as the Affinis Snyders and the Snyders types are very similar to this type. The Hopewell - Snyders has really never be named as its own type by the archaeolgical community. Some Lowe Flare Base points also look similar and may be chronological decendents of this type. Other similar types include the Gibson, Northon Corner Notched, Bay de Noc Side Notched, Burnt Bluff Expanded Stemmed and the Ross point. The Mund site in Illinois yeilded dates of 120 to 120 years BC and this dates the classic Hopewell sequence very well (Fortier, 1983:395). Many examples of this type, found in Illinois and Missouri exhibit heavy use wear as scrapers and many have been halfted into scrapers. It is belived that most started life as knife blades and were turned to the roll of scrapers as rework reduced the tool. The Hopewell - Snyders point type is found all over Indiana, the Wabash River drainage area in Ohio as well as Illinois. The size of the Hopewell - Snyders point can range from 42 mm to 200 mm in length with the typical point being in the 57 mm range. The average width of the blade is between 31 mm and 52 mm with the average being 40 mm. The average stem width is 27 mm and an average stem length of 15 mm. The Hopewell - Snyders point type was described by Edward G. Scully in 1951 for the Snyders Hopewell site in Calhoun County, Illinois.